At least 12 people have been killed in fighting between Sri Lankan troops and Tamil Tiger rebels in eastern Batticaloa district, the military says. At least four soldiers died and the bodies of at least eight rebels had been recovered, the military said. The rebels have not commented. At least 14 soldiers were injured in the clash, the military said. Analysts say the island is sliding back towards full-scale civil war, although a ceasefire remains nominally in force. The rebels and the government agreed the truce five years ago but more than 4,000 people have been killed since fighting flared up again in late 2005. Wednesday's fighting around an army camp at Sittandy near Batticaloa was the heaviest fighting for several months, military officials said. A spokesman, Lt-Col Upali Rajapakse, said a force of Tamil Tiger rebels attacked four army bases from the land and sea. The rebels set up mines and explosives on roads nearby to hamper efforts to bring in reinforcements, he said. But Sri Lanka's military says the attack was repulsed and during a search operation the bodies of eight rebels, including a woman, were found by the perimeter fence of one of the bases. There has been an upsurge fighting in the east, and tens of thousands of people have fled their homes in the district of Batticaloa. The BBC's Roland Buerk in Colombo says government forces have driven the rebels from towns and villages in the Eastern Province and are now trying to capture the remaining pockets still under Tiger control. 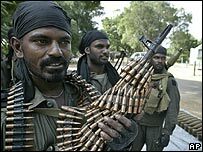 The rebels have been fighting for decades for a homeland for minority Tamils in the north and east of Sri Lanka.